Pool Guard pool fence uses only the best materials available when building your removable pool fence to make your pool safe for kids. The pool fence poles are made from a 6063 marine grade aluminum that is powder coated in our manufacturing facility in Clearwater, Florida (All made in the USA). 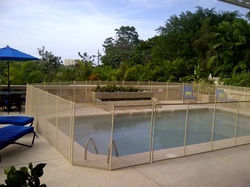 Pool Guard Fence has border, stitching and mesh that all have UV (ultraviolet) protection to protect the product from the fierce Puerto Rico sun. Our pool safety fence has a limited lifetime guarantee against fading, craftsmanship , poles rusting, screws rusting, latches rusting. 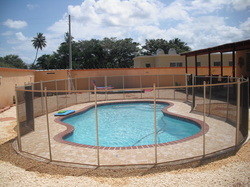 Below are a few samples of the many pool fences we have installed in Puerto Rico. We look forward to working with you to make your pool safe for kids. 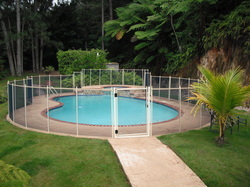 This is an example of a two side pool safety fence installed in Guaynabo, Puerto Rico. The self closing gate is on the right side of the corner of the photo. The parents and grandparent were very happy to have a fence around the pool and a pool safety net installed on the waterfall next to the entertainment area. This pools are now secure. Pool Guard of Puerto Rico covers the entire island! This is another installation done in preparation for the annual festivities at his house to make sure that his grandchildren are protected. 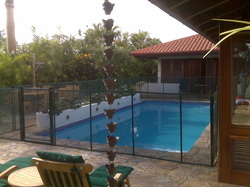 Another satisfied pool fence customer in Puerto Rico! 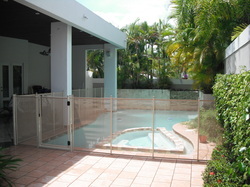 As you can see the pool fence was installed with the industry leading pool safety gate. This gate is self closing, self latching and lockable. Simply the most reliable in the industry! Why trust anything else when it comes to pool safety? An amazing backyard with all the best finishes simply required one more product to keep their daughter safe. 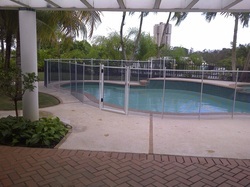 A Pool Guard removable pool fence with self closing, self latching and lockable gate was added for optimal protection. Pool safety fence installed to protect the owners grandchildren as well as the children of staff that bring their children to the property occasionally. 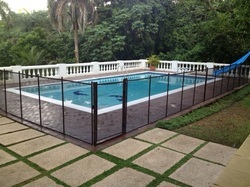 The pool is now secure and the owners feel more at ease with their Pool Guard pool fence. Removable pool fence installed to protect the owners new baby as well as the children of the guests he has when he frequently entertains. 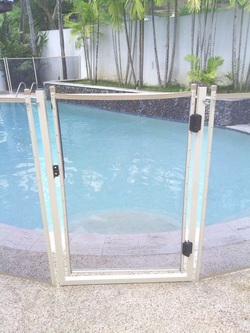 The owner also had a self closing, self latching and lockable pool gate installed for safety purposes. 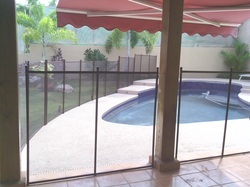 Removable pool safety fence installed to protect grandchildren from going near the pool. Beige border, Beige poles and blue mesh. The gate is a self latching, self closing and lockable gate. 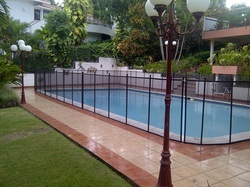 -Pool fence was installed for the protection of children. Please note the corner post unique to Pool Guard allowing corners to be made very rigid and therefore the strongest in the industry. Boqueron Marina has a mandate of white for fences however the only fence that most owners have is the dividing fence between each housing unit. Pool Guard of Puerto Rico installed a removable pool fence to keep the grandchildren from possibly falling into the water while at grandma and grandpa's house. 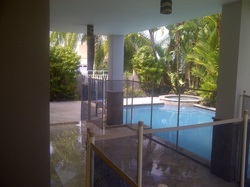 Another secure home by Pool Guard of Puerto Rico. 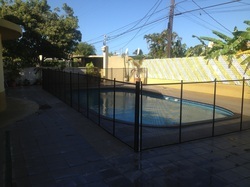 Pool fence was installed around an indoor pool for the protection of a family dog that is over 14 years old. Pool safety fence is not just for children. This pool only needed a fence on one side as it had three existing fences on the other sides. Note the self closing, self latching, lockable baby gate. This fence was installed half in the concrete pool deck and the other half was installed in the ground through the yard. 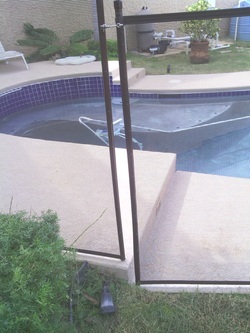 The owner was thrilled to have a pool fence around his pool that he could take out. As you can see the self closing, self latching, lockable gate matches up perfectly with the fence. 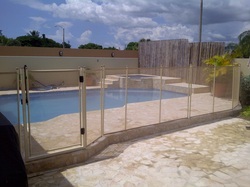 This installation was done for a custom pool builder here in Puerto Rico. Why did he contact Pool Guard? 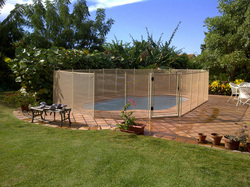 "I prefer Pool Guard fence as it has the durability needed here in the sun of Puerto Rico". As you can see there were multiple steps and the fence turned out great! Casa de Campo, La Romana Dominican Republic. 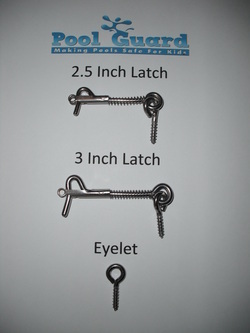 Each section of pool fence is latched to the next using a 318 stainless steel spring secured latch and eyehook. The challenge with using this joining section of fence sections is that if it is opened and not closed back (by the person that opened it...homeowner, pool maintainence personnel or other backyard guest,then the pool is accessible and an accident may occur. The security a self closing, (closes by itself due to spring loaded hinges and magnets integrated in the latch) self latching and lockable gate is beyond words. It just makes sense to have a gate that closes behind you and that you can lock. The signature "U" shape monolithic frame is durable, non fence dependent and reliable which are the key factors that every pool fence gate should have. Pool Guard pool fence gates are color coordinated with the fence so the aesthetic look is consistent. 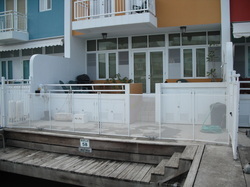 Removable pool fence can be installed going up steps and even through the yard where there is no concrete. Pool Guard has the experience needed to make your pool safe. 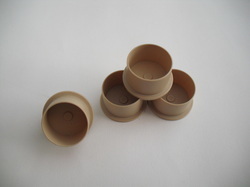 Pool deck caps come in three different colors Beige, Grey or White (these insert into the deck sleeves when the fence is not installed). 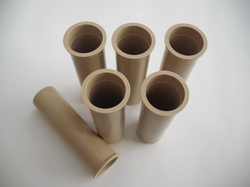 We provide these to you free of charge with every pool fence installation. Pool Guard uses spring loaded latches to make sure the spring closes each time when latching one section of fence to the next or anchoring the fence to the wall. These latches are made of 318 stainless steel.